This is the first in Indigo Trilogy, and is about indigo children, I will admit that I really didn’t know much about them, and curiosity definitely took over when it came to reading this. Indigo Incite follow twin boys, who of course have a special ability to hear each others thought and communicate, but also can hear the thoughts of those around them. Toby has been kidnapped by people who want to use the indigo’s for basically their own purposes, and this in not going to happen if Tyler and Toby can help it. The problem is, Tyler has to find Toby first, which isn’t going to be easy. Tyler and Toby are amazing young guys. They live in a foster home with parents who were horrible, and just wanted to money they get for “caring for them”. But even with the home life they had they had, they were still hopeful, and were strong and determined, so it wasn’t hard for me to want them to succeed and get away from it all. Eddie, Liliana and Sarah, the others in their little group were different in so many ways, they all came from different backgrounds, family lives but the connection they had because of their abilities made them become friends quickly and you would think they had known each other for a long time. Needless to say, I think they all were great and I am hoping to get to know them even more as the series goes one. Being told from a few different POV’s, giving that chance to see all the sides, and with a lot going on from start to finish, it helped immensely. My favorites POV’s of course were Tyler and Toby. The powers were fascinating, and each of the Indigo’s were a little different. Tyler and Toby were separated at the beginning but their brotherly bond was so strong, and never wavered. There were so many things about this book that I enjoyed, the ranging ages of the 5 of them, romances blossoming, not base how they looked or where they were from. Just for who they were, but I am happy that the romance didn’t take over the main point of the plot. The Indigo children were completely fascinating, and learning about them was fantastic. The suspense was spread throughout and kept me turning the pages to see what could happen to them next. Sci-fi has been a hit or miss with me lately, and I have to say that the sc-fi and fantasy aspect was done very well, and I enjoyed it. I think my only complaint about this book be the end. The awful cliffhanger, that’s not to say that I wasn’t happy with because. I just have to want to find out what happen now. Looks like the next book is Indigo Instinct, but I haven’t found a release date yet, but I will be on the lookout. 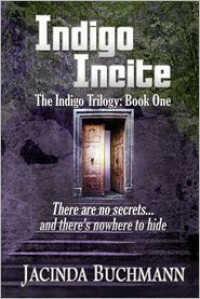 Indigo Incite is a wonderful start this series, and one that I will looking forward to continuing. It has just the right amount of suspense, great character, and such an interesting concept. I would definitely recommend picking this one up.